Here's a completely yummy chocolate pumpkin cookie recipe that's ever so easy to make. 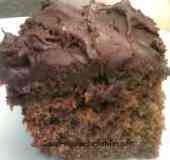 This is one of those easy recipes, that takes minimal effort to produce a sensational result! It takes just a few minutes to throw all the ingredients into a pot, combine it well and spoon the batter onto a cookie tray and 12 minutes to bake them to perfection! Firstly in a roomy saucepan, melt butter with sugar. 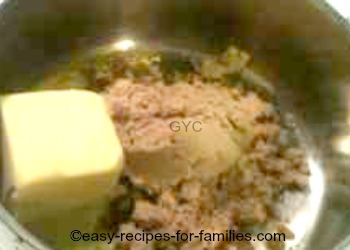 It is important to take it off the heat as soon as the butter has melted to avoid burning the mixture. 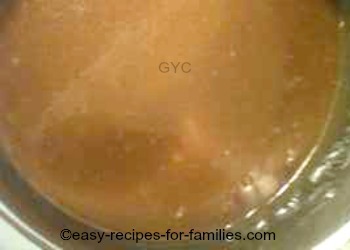 Keep stirring till the mixture looks like a thick caramel sauce like in this picture. Here is the flour and bicarbonate of soda added to the caramel mixture. Add in the beaten eggs, too. 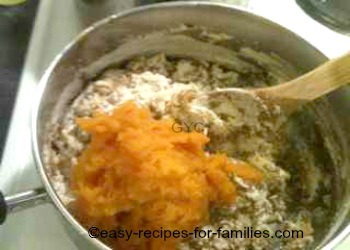 Toss in the pumpkin puree into the mixture. Mix well. It will become a thick batter and dry enough that the dough/ batter mixture moves away from the side of the bowl. 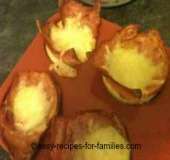 Use a teaspoon to scoop a portion of doughy batter. 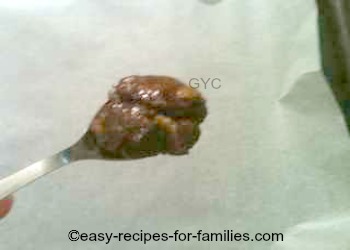 Place spoonfuls of the mixture onto the lined baking tray or on a non-stick sheet. Notice the space between the cookies. Allow about 3/4 inch expansion space. Here they are, beautifully baked, fresh out of the oven. 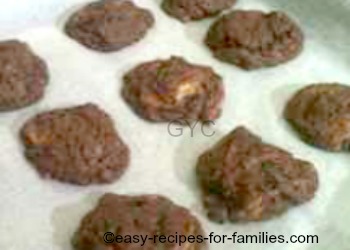 Enjoy these yummy cookies in lunchboxes or as a quick after school snack. Here's another snack that's very popular - This pumpkin bar can be whipped up at the same time while the oven's on. This recipe makes 70 cookies. 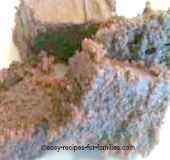 •	Into a large mixing bowl or saucepan, melt butter and sugar, combine till it becomes a thick smooth mixture. Take it off the heat as soon as the butter has melted but keep stirring. •	Add the rest of the ingredients. 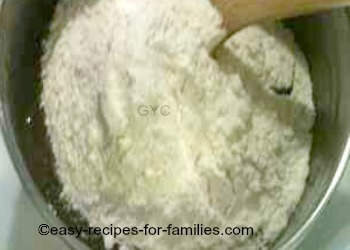 Stir till it goes from dry and lumpy to a thick firm batter. The choc chips will melt into the warm doughy batter. 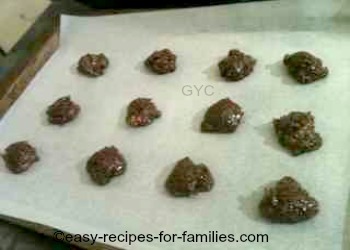 •	Scoop s teaspoon of batter, roll it into a little ball and place on the cookie tray. Repeat, leaving about 3/4 inch between the cookies to allow room for spreading. Allow to cool before decanting into an airtight container. 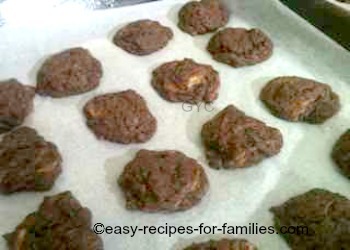 This simple to make recipe makes lovely soft cookies, not overly sweet, which the kids will love for their lunch boxes. If you're not using non-stick cookie sheets, be sure to use greaseproof baking paper, otherwise please grease and line your cookie tins well. 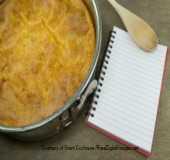 To cook the sweetened pumpkin puree, stew 1 pound of fruit in water with 2 tablespoons of sugar. Be sure to drain it well or your baked yummies will be soggy. If you'd like to learn how to make pumpkin puree, just click to take you to the tutorial. 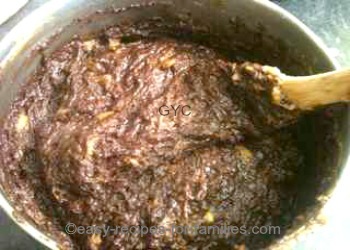 A nice variation is to use stewed but not pureed pumpkin, so that you have colorful chunks of pumpkin as a contrast. 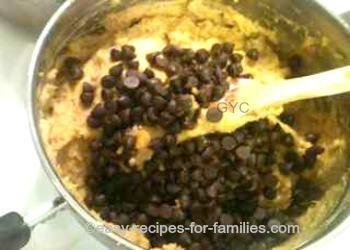 Leave Pumpkin Cookie Recipe to discover heaps of recipes for yummy baked treats.